John S. Kinnard – Premier Luthier! Today we acquired two ukes made by John Kinnard. John has been a luthier for over 40 years in the San Diego area. He’s a one man operation and it shows (in a good way). You can tell he has built instruments for many years. He has also pursued art as a painter and a jeweler. I can tell this by the way his ukes are built. No, actually I just looked at his website and learned that.kinnardukes.com. But you can see the artist in his beautiful design and a jeweler like attention to detail in these instruments. This is a one man building operation, so John is busy building ukes. The man that runs the business and sales is Kevin Beddoe. Kevin and his wife Deb stopped by with these ukes for us to look at, and I have played Kinnards before and liked them, but both of these were just outstanding to me. This tenor is setup so low (about 2.2mm at 12th) and it just sings! Kevin tells me they changed the bracing less than a year back and it has made the tone much more full. It’s true! 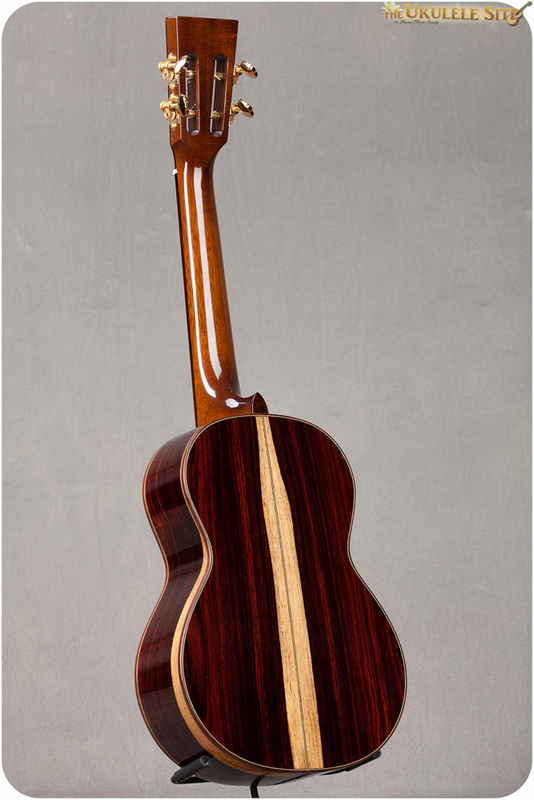 We had a Spruce rosewood tenor, similar wood properties to this spruce cocobolo tenor, and I thought it was a good, excellent instrument, but not this good. This voicing is much more open. Beautiful! I’m always excited to see and hear this level of musical quality and craftsmanship, and I have mostly tenors myself, so naturally this tenor is up my alley. But the one of these that I had to keep for myself is the soprano! Why? Because this is the best soprano I have ever played. I’m serious. * This is my holy grail for soprano and I’ve never played anything like it. The body is a little deeper and the lower bout is a little wider than the average soprano but it fits perfectly into my Crossrock Fiberglass soprano case, so it travels well. And let me tell you, this tone… this is not your grandfathers soprano. It sustains like a tenor and has such wonderful balance and articulation all over the neck. Like I said, it’s the best soprano I’ve ever played and I’ve wanted something like this for a long time. SO easy to play and SO musical. I am so sold on this soprano that I asked Kevin if we could take all the sopranos John makes and have the exclusive on them. He said Yes!! 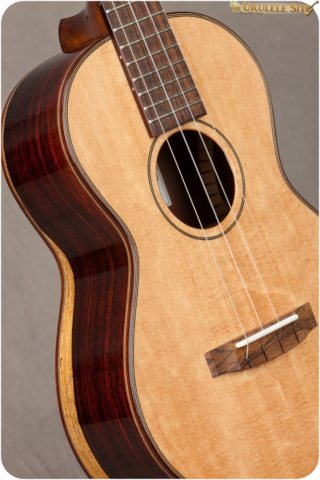 So along with regularly getting the tenors and an occasional concert, we will have the joy of documenting each custom Kinnard soprano made and offering it at The Ukulele Site. This is huge! Why? Because, I’m telling you, this will be the ultimate soprano for some of you. Maybe not the vintage boxy sound. You might be able to go inside a barrel with this one and get that. But it’s different. Open like the sky with focused attack, remarkable sustain, and an even balance of tones. It’s like the soprano you never had. Stay tuned and look out for the tenor to hit TheUkuleleSite. *Best in any art craft or music will always be an opinion. John has done what I have heard some luthiers say would not work. He made a soprano body deeper and wider at the lower bout and it truly sounds bigger. Still joined at the 12th and it is a 13 3/4″ scale so slightly longer scale, but not even close to the 15″ super soprano. And it fits in a soprano case we will provide for it. Fiberglass with a shoulder strap. Perfect little package with some serious tone. There’s gonna be some killer sopranos in our future. Maybe you can try one! I have a Kinnard tenor and it is the best instrument I have ever played. I a very interested in this soprano! Thanks David. I think you’ll really like the soprano. So easy to play for long periods. First of all, congrats Andrew on getting the exclusivity on the Kinnard sopranos. If someone played a sound sample, I would have never guessed it was a soprano as it’s fuller sounding than what I’m used to in a great way! There’s definitely a market for these!! What is the first song Corey’s playing on the soprano as it’s lovely? THanks Daniel. I am not sure, I will ask Corey. I know you are a tenor guy but you should try my soprano when you’re in town again. I’m gonna start traveling with this instead of a tenor. Congratulations to The Ukulele Site and Kevin Beddoe of John S. Kinnard Ukuleles! That is so awesome to hear Andrew, being an exclusive dealer for sopranos? I met Kevin and his lovely wife several times at various festivals. Really nice people. I am so happy for people I know doing well with ‘ukulele. Onward and upward! 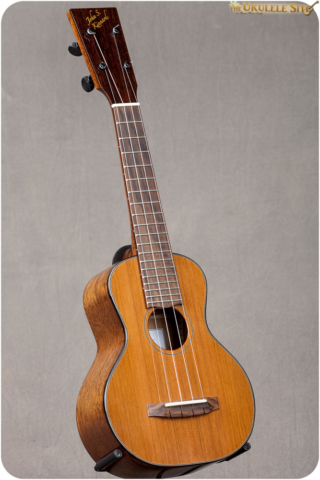 I have a Kinnard Walnut Concert and it is my go to ukulele. It is well balanced, loud, has great sustain and is a joy to play. Congratulations on the exclusive agreement for his sopranos! I was on vimeo and the two Kinnard sound samples had just been posted. I was blown away by the soprano, truly special sound. 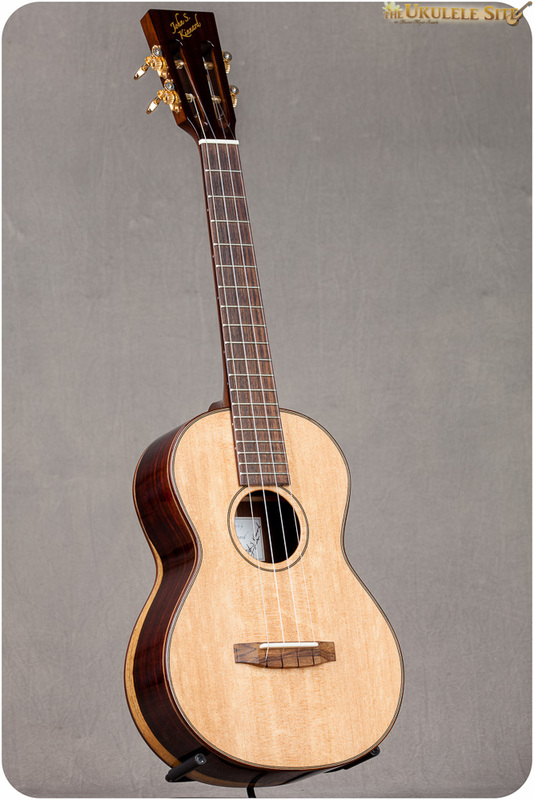 I thought that would be a great uke to buy, just like the Peppe custom mahogany, seems we have similar tastes, lol. Congratulations on both representing and owning Kinnard sopranos. Haven’t tried his Soprano yet but own a tenor and a concert. John has a signature tone which is inherent to his builds and I have become taken with that sound. Although I own a dozen ukes, I reach for my JSKs when I’m playing for me.